One of the most difficult parts of starting and growing a business is finding customers. Having a great product or service may not be enough to find customers. That is why customer acquisition is the lifeblood of a startup. In simplest terms, customer acquisition can be defined as gaining new customers. Customer acquisition requires convincing people to buy a product or to pay for a service. By adopting the right customer acquisition strategy, you can gain new customers in a cost-effective way which will contribute to your startup’s growth. work on your personal network to get more feedback about your business and products. In the acquisition phase, you need to ensure that your potential customers know about your startup and solutions. Thus, they will include you in their buying decision process. To manage this, establish your startup on the right channels that your audience mostly prefers. Marketing can help you convey your message across multiple channels in a way that grows your customer base. Below is a list of marketing tips you can apply for increasing your customer acquisition rates. Your website will be the first point of contact for your potential customers. When you consider the importance of the first impression, welcoming your audience with a well-designed and content-rich website can increase your chances of customer acquisition. Keep your website up-to-date with valuable content that answers your customers’ questions. Use the power of SEO which is among the most effective unpaid marketing methods. Provide enhanced user experience to prevent high bounce rates. Include interactive content to increase engagement rates. Generate leads by offering free resources like whitepapers, e-books, data sheets etc. Know your audience and try to understand their needs. Consider what they would want to know about your products, solutions, industry etc. and provide them with this information. Be customer-oriented and try to answer their potential questions instead of promoting your services. Update your blog regularly and post new content often. Position your startup as an industry expert and provide your audience with valuable content. According to Marketo, 81% of shoppers research online before setting foot in a store and consumers spend an average of 79 days conducting online research before buying. This means your potential customers will look for information to give the right decision. And the quality of your content will have a direct influence on their purchasing decision. With content marketing, you can convince your audience that your products are worth trying. Know your audience well and target the channels according to their interests and habits. Share valuable information that can create a difference in their lives. Provide them with evergreen, informative content like a white paper, survey report or e-book instead of a sales pitch. Publish new content regularly on different channels to increase engagement. Use the right SEO tactics to increase the visibility of your content. Know everything about your industry and share what you know in a generous way. When used strategically, social media can be an effective customer acquisition channel. Getting more followers on social media profiles helps you introduce your solutions to a broader audience. Users are likely to purchase something from a brand they follow on social media. By engaging with your audience in a friendly and helpful manner, you can develop strong relationships on social media. This helps you build trust which increases your chances to convince them to buy your product. You don’t have to be on every social platform. Find where your potential customers hang out and focus on these platforms. Be ever present on your social networks and answer messages on time in a way that provides value. Find the influencers your audience follows and reach out to them with something they can be interested in. Develop exclusive content for social followers, based on what your analytics data tells you. Try to get known as a helpful friend instead of someone who is trying to sell something. While measuring your efforts focus on engagement rate instead of follower numbers. As a targeted, cost-effective and measurable method, email marketing helps you directly reach out to your potential customers. You can customize your messaging according to the interests of your audience by targeting and segmenting your emails. Since many popular email marketing services offer freemium packages, email marketing doesn’t require large budgets. These services provide in-depth reports and performance tracking features. So, you can measure your efforts easily and accurately. Build email segments according to your audience’s interests and customize your campaigns accordingly. Use a personal tone to increase engagement. E.g. personalize subject line with first names. Include relevant and valuable information in your messaging. Don’t forget to add the call to actions like asking your audience to visit a website, register for an event, download a document etc. Measure your performance and take actions to decrease bounce rates and increase readability. When compared with paid methods, public relations (PR) is among the most cost-effective ways to promote your startup. PR uses publicity and nonpaid forms of promotion to positively influence people about your company, products or solutions. By getting your startup covered by the media, PR helps you to increase your visibility, raise awareness and build trust. This contributes to reaching more people and acquiring new customers. List media outlets and journalists to find the right ones that directly fit your needs and target them. Attend networking events where you can meet journalists and press members. Use the power of interpersonal relations to contact journalists you target. Create valuable content that is exceptional enough to pull journalists’ attention. Set up an online press center that includes valuable resources for the press; like press releases, media kits, previous media coverage etc. Sales promotion is a good way to persuade customers to try a new product or solution. It includes free trials, discounts, bundles, additional content etc. To pull your audience’s attention, your promotions need to provide real value for them. In other words, you need to offer a legitimate reason for them to consider buying your product or solution. Determine what you would like to accomplish with your sales promotion and set goals to accurately measure your efforts. Try to find out what kind of offers your potential customers will find most interesting. While designing your promotional message, create a sense of urgency and limited availability. Consider your audience’s channel preferences and design your campaigns accordingly. While measuring the results of your promotional efforts focus on conversion rate. Feedback can help you in two ways: First, you can use it to see how things go with your product. In other words, it points to the areas that need improvement. Second, you can use feedback as a referral especially when it includes positive reviews. Both ways contribute to your customer acquisition strategy by allowing you to provide solutions that better answer your audience’s needs and convincing them that your product is worth trying. Ask your users how their initial experience with your product or service goes. Never ignore your audience’s reviews, figure out what you can improve your product. Offer easy-to-use feedback channels to increase their response rates. Encourage customer referrals by rewarding them with discounts, additional services etc. In your referrals, try to show how your product improves your audience’s life. 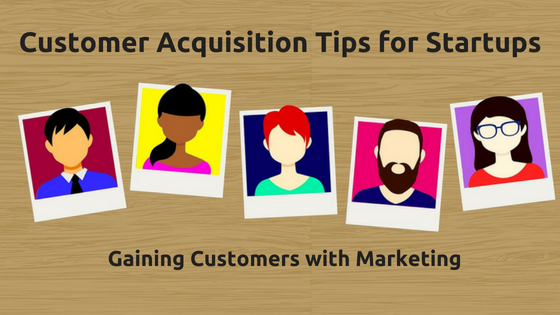 As a startup, customer acquisition plays a crucial role in your success. To gain new customers, you need to introduce your products and solutions in a way that convinces your audience to buy them. This requires an effective customer acquisition strategy. By supporting your strategy with different marketing tools, you can convey your message to your audience in a way that increases their likelihood of buying your products and services.